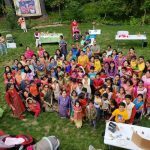 It was time for celebrating a year’s worth of hard work and learning for the children of Seattle GOD Satsang. It was Annual Balagurukulam day! 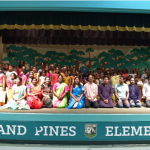 For this year, the Annual Day’s theme was ‘Bonding Through Srimad Bhagavatam’. This event was celebrated on 30th October 2010 at Vedic Cultural Center, Sammamish. The hall was resplendent with Sri Premika Varadan-Madhuri Sakhi and smiling Sri Swamiji facing the audience. The children were provided with T-shirts carrying their respective character name from Srimad Bhagavatam like Kunti, Bheeshma, Veda Vyasa, Parikshit, Prahlada, Gajendra amongst others. This in turn was their pseudoname throughout the event! 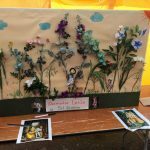 This idea was very much relished by the children and everyone present. The event started off with a Shloka Competition which included shlokas from ‘Dhyana Shlokas’ and ‘Kunti Stuthi’ from Srimad Bhagavatham. The participating children were divided into two age groups, below six and above six. Smt Archana Mayani, an ardent devotee of Krishna, a Sanskrit exponent with a love for culture and traditions was the judge for the shloka contest. It was very heartening to see the way Archanaji connected with each child by referring to them with their pseudoname and motivated them to chant the shloka. We have all heard about Prahalada, Bhakta Meera, Lava-Kusha. 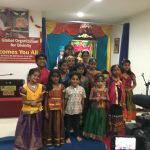 During the contest, we could see the children singing shlokas and brought before our eyes, Lava-Kusha, Meera and Prahlada! Dandiya Sticks decoration was the craft activity that ensued. This was organized by Vaishnaviji. The children were taught to make and decorate Dandiya Sticks. The fun then began! 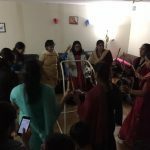 It was a Dandiya Raas-Garbha Raas dance workshop by Sonaliji and Archanaji. Archanaji beautifully articulated on these dances being Lord Krishna’s favorite pastime….one could see the divine Krishna Leela with Gopikas at Vrindavan at this very moment! All the participating children were awarded with a certificate of achievement for successfully reciting the Shlokas from Srimad Bhagavatam. The winners in each category were awarded with trophies and medals. 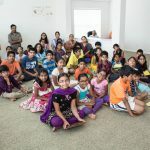 The children enjoyed a sumptuous dinner of sphagetti, popcorn, cake and gulab jamuns cooked by the Bhaktas at the Vedic Cultural Center.